As the United States gears up to remember its fallen heroes on Memorial Day on Monday (May 30), social media is abuzz with a photo of an emotional Haitian-born cadet at his graduation from the elite West Point military academy. The image of Mr Alix Idrache with tears trickling down his cheeks as he stands at attention has notched over 21,000 likes and 9,000 shares since it was posted on West Point's Facebook page on Tuesday. "No greater feeling than that of accomplishment!" read a short but apt description of the picture. Mr Idrache worked his way through one of America's most prestigious military schools after immigrating from Haiti in 2009, earning his citizenship and serving for two years as an enlisted soldier with the Maryland Army National Guard, the Washington Post reported. 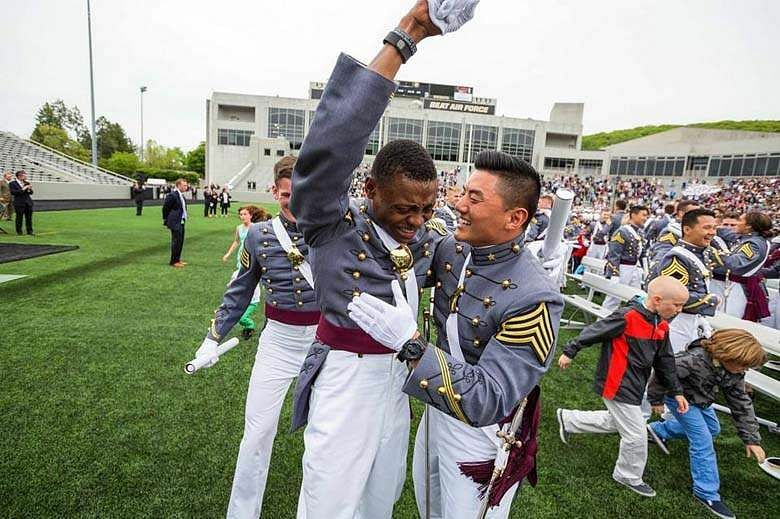 The second lieutenant, who was named a regimental commander last summer according to a West Point news release, was among a class of 950 cadets to graduate on Saturday. He was the cohort's top-ranking graduate in physics, something even he could not fathom as he grew up speaking basic English in a working-class neighbourhood in Port-au-Prince. "I woke up this morning and found my face all over Facebook and with it myriad of amazing comments about my accomplishments," Mr Idrache wrote on his Facebook page. "I am humbled and shocked at the same time. Thank you for giving me a shot at the American Dream and may God bless America, the greatest country on earth." In his youth, Mr Idrache witnessed US forces conducting humanitarian missions in his homeland, and was fascinated by the Chinook helicopters. In July, he will enter flight school at the Army Aviation Center for Excellence in Fort Rucker, Alabama. Netizens praised Mr Idrache's resilience and determination to succeed despite his humble beginnings, with some calling it a prime example of the American dream. In a separate Instagram post, Mr Idrache paid tribute to men and women "who have preserved the very essence of the human condition stood in that position and took the same oath". "Knowing that one day I will be a pilot is humbling beyond words," Mr Idrache wrote. "I could not help but be flooded with emotions knowing that I will be leading these men and women who are willing to give their all to preserve what we value as the American way of life."